During this dark time of year, it can be tempting for staff to bring candles into their work-spaces to create a warm, cozy atmosphere to combat the dreariness outside. However, doing so may affect the health and safety of your staff and students. Although candles add a welcoming warmth and glow, they can also contribute to indoor air pollution and present a significant fire hazard. In fact, the National Fire Protection Association (NFPA) reports that December is the peak time of year for home candle fires. According to Elizabeth Jakab, industrial hygienist at the Puget Sound Workers’ Compensation Trust, candles emit particulates in the form of soot. They can also emit trace amounts of a range of harmful chemicals, including carcinogens such as benzene, toluene, and formaldehyde. 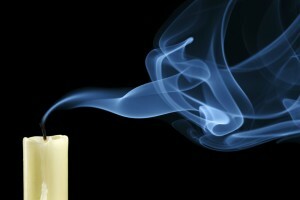 In addition, some imported candles have metal threads in their wicks that may release lead and zinc into the air. Based on studies, it appears that the worst offenders are paraffin, scented, and aromatic candles. Even soy-based and beeswax candles, which are commonly touted as healthy alternatives, may emit trace amounts of harmful chemicals. While these harmful emissions are typically low and do not pose a significant threat to your health, they may trigger allergic reactions and asthma attacks in sensitive individuals. According to national statistics, an average 10% of students have some degree of asthma. Symptoms of exposure to emissions from burning candles may include itchy and watery eyes, sore throat, blocked nasal passages, headaches, hives, skin irritations, and difficulty breathing. Any of these symptoms may interfere with a student’s learning. Burn mark from candle holder. The second obvious concern of burning candles at school is that they create a fire hazard. 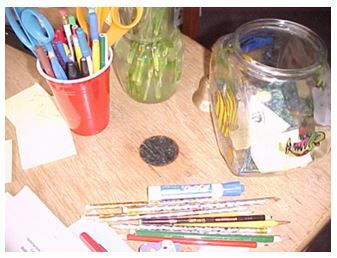 A few years ago, a district staff member left a candle burning in an elementary school classroom. Over the course of the evening the candle burned down and the metal plate candle holder burned into the top of a desk. Noxious fumes filled several classrooms and fire fighters responded in the middle of the night. Luckily, a major fire was avoided. However, one teacher working late in the building was exposed to the fumes, and filed a workers’ compensation claim for respiratory irritation and toxics inhalation. While the damage was minor in this case, candles have the potential to do serious damage. According to a report issued by the NFPA in 2013, analyzing the frequency of fires started by candles, an average of 29 home candle fires were reported per day during 2007-2011. We want to create a healthy environment that is conducive to student and staff engagement. For additional information on this topic, contact our industrial hygienist, Elizabeth Jakab, at ejakab@psesd.org or (425) 917-7640, or review our Scents and Indoor Air Quality handout.